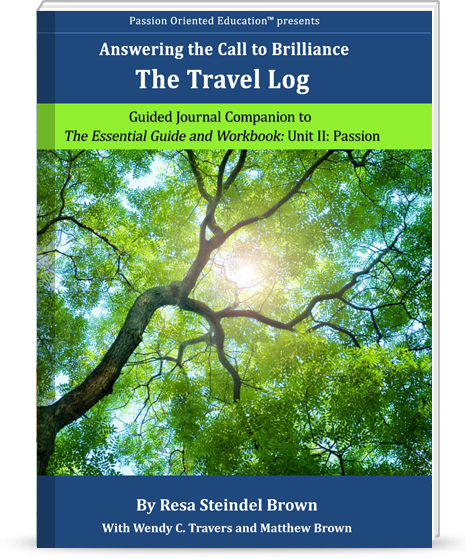 The Travel Log, Unit II Passion, is the second of three guided journals directly coordinated and to be used exclusively with Unit II in Answering 'The Call to Brilliance,' The Essential Guide and Workbook. The Travel Log is designed to help you stay organized and on track while preserving your observations and insights for future reference. ***INTRODUCTORY OFFER***Buy one Travel Log at full price ($24.95) and get additional Travel Logs for $12.95 each at time of purchase. Discount given at checkout. 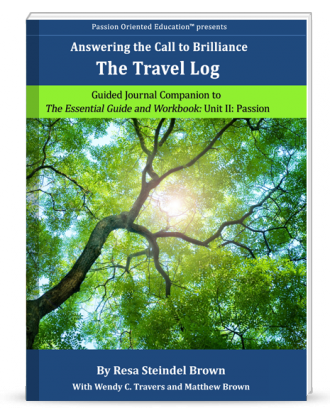 This guided journal corresponds directly and is to be used exclusively with Unit II Passion in Answering 'The Call to Brilliance,' The Essential Guide and Workbook. Now that you have found your child's active interests in Unit I, Unit II will help you create a record of the conditions, resources and environments within which your child's passion can blossom. We designed The Travel Log to help you organize your thoughts, feelings, and insights, and capture them as you help your child find and develop his or her passions and brilliance. The on-the-go format makes it easy to move back and forth between The Essential Guide and Workbook, also known as The Workbook. and your observations as you move through your week. It is a great way to keep your thoughts and perceptions clear and clean, remember exactly what you observed, and take appropriate action as the need arises. You never know when insight strikes and a new perspective, or direction reveals itself! In Unit II, we will help you fuel and ignite your child’s active interests into passions. Your journal entries will be based on what you observe and what you learned through the correlated information in The Workbook. You will start by identifying and itemizing specific themes within your child's range of active interests. We will help you prioritize and chronicle which activities within your child's themes are most likely to help your child's passions flourish. You can use your list as an ongoing guide for future reference. Along the way, we will also help you chart your child's natural pace and rhythm as you observe and record your child’s behaviors to identify what is working best and why. In The Workbook, you will learn how to plan, track and manage the time, energy and resources necessary to prioritize passion and accomplish your objectives. In The Travel Log, you will record the real-life information that helps get you there. Our goal is to help you, help your child, deepen the connection to passion and creativity on the way to finding brilliance. As you did in Unit I, read the information presented in the corresponding section of Unit II in The Workbook. Then, use this guided journal to record your observations and ideas. Return to The Workbook to summarize your findings and use that information to execute the respective workbook activities. The Travel Log makes it easy to move back and forth between The Workbook and your observations. The on-the-go format was designed to help you capture your thoughts, feelings and insights as they happen, so you can better help your child. To that end, we hope you will continue to carry your Travel Log around with you as you move through your week, ready when a new thought stirs and an epiphany reveals itself. Using this journal is a great way to preserve your insights and perceptions as they happen, creating a bridge to your child's next step.